After Phoenix, I thought I’d take a break from Vlad for a while, but I kept getting this image of Vlad, wearing a poncho and smoking a cheroot, walking into a bar. The image wouldn’t go away so I wrote this one to exorcise it. So, in Athyra, was Vlad really telling the truth when he said that he didn’t do anything to Savn’s parents except take responsibility for Savn being late? If not, what did he do? That was a long time ago, sorry. I have a half memory that he’s lying; that he put a spell on them. But I won’t swear it. Okay, I was just curious. Thanks for the response! I’m really enjoying listening to the Taltos books on audio. I read the first 6 or so when they first came out, but then I lost track of the series and it has been great to go back through it in a format that I can listen to while I do other things. Thanks so much for making them available this way! 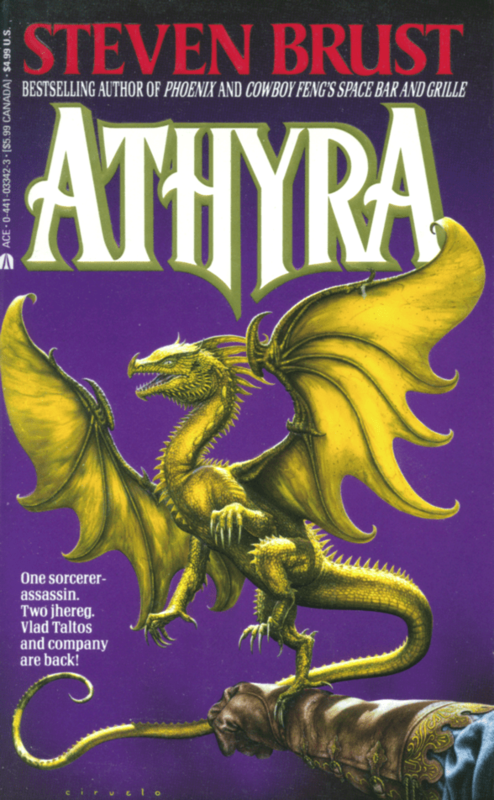 I’m reading Athyra now. Enjoying it. Found a typo… I once wrote you (around 2.5-3 years ago) with some errors I found in a book. You told me I could contact some editor/publisher with them. Who/where/what would be that contact now? I have yet to read a book, of any appreciable length, which does not contain some gramatical, punctuation, or spelling errors of some sort. To Chris: Absolutely true, although I feel that these errors need not appear in newer editions if readers simply write in and mention them. To Steven: My husband didn’t care for this one, but I rather liked it. It was frustrating at times, wondering what Vlad was up to, but at the same time I enjoyed the change of pace. I’m dying to know what happens to Savn now.